Tempo, which was technically Vidal & Sohn Tempo-Werke GmbH, was a German company that built vehicles between 1924 and 1977 in Hamburg. They were initially known for three-wheeled commercial vehicles and commercial vehicles would remain their specialty for all of their existence. The Matador was a commercial chassis that was built in multiple series between 1949 and 1966 (though the Matador would remain in production by Hanomag through 1967). You could have a Matador as a pickup or a van. This particular example is powered by a 1.5-liter straight-four from Austin making 50 horsepower, which might not sound like a lot for such a big vehicle, but because its body is aluminium it only weighs about 4,500 pounds. This “Landyacht” was specially bodied by Karosserie Mikafa in Germany for a Hungarian Count, whose wife was part of the Vanderbilt family. Everything in it is custom and original (like etched glassware and other stuff you’d expect a Vanderbilt to put in their RV). It was used for two European holidays before it was shipped to the U.S. and parked at The Breakers, the famous mansion in Rhode Island, in 1971 with just 13,000 miles on it. The current owner acquired the vehicle in 2015 and only seven of these Reisemobils still exist, with this being the only one in the U.S. It’s a pretty unique vehicle with a very interesting story. It is expected to bring between $150,000-$200,000. Click here for more info and here for more from this sale. 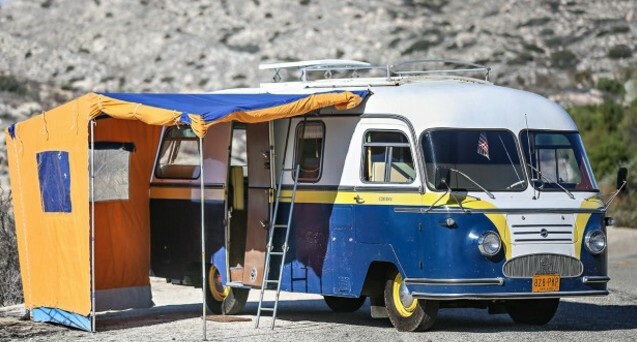 This entry was posted in Uncategorized and tagged 1959, auctions, buses, gooding & company, landyacht, matador, mikafa, reisemobil, tempo by classiccarweekly. Bookmark the permalink.